Dog trainers are expensive. Do you need to hire one to have a well trained Pug? No. But you do need learn some techniques if you’re going to have a well behaved pet and not rely on the resources of a professional to get one. If you develop some success in this area you might want to consider starting a little business if it’s something you like to do. Many people just don’t have the time to train their dog or go about it in the wrong way. In fact, a good Pug Training Class is hard to find. There are some basic approaches that have proven to be successful. We couldn’t possibly cover everything here but we will give you a very good start and lead you to some other resources to consider. The one thing you should know is that it’s absolutely worth it! There is a tremendous difference in a well trained dog and one that you cannot control. This may be even more true when it comes go a Pug! As we’ve noted before, Pugs are born to be a companion and they take that calling very seriously. You can work that to your advantage because Pugs aim to please their owners. They love you! They show that love in many different ways. Left to their own instincts they’ll smother you by following you around the house and jumping all over you to show you their affection. housetrain their Pug. With the key ingredients of consistency, positive reinforcement and patience dog training becomes a behavior science and can be mastered by any owner willing to invest the time and love in training their dog. More Advanced Dog Training There's more excellent information available online. In fact you can even try a free sample lesson. The training is illustrated and takes you step by step and the information is absolutely first rate. 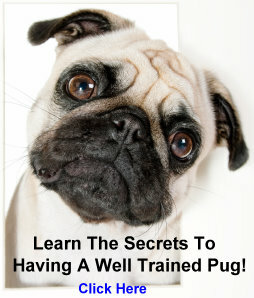 Want To Learn the A To Z of Pug Training and Care?